Sometimes you need to design some creative organization chart for your corporate presentations but you can’t find good ideas. This article will review some creative organization charts that we can find online with information about the company and corporate organization structure from the top CEO to the low level employees within an organization. Normally organizational charts are designed in a tree view or tree structure but depending on the organization hierarchy we can think about other ways to show the organization chart structure. For example, we may try to use a network to design a org chart with many different vertical and horizontal connections as well as other visualization tools that can be used for organizational charts. 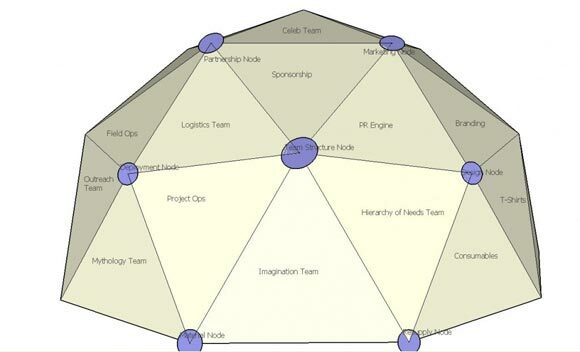 In Knowledge Fulcrum we can find this org chart with an interesting mesh. The nodes connect each employee or staff member and you can see the department represented with the triangles. 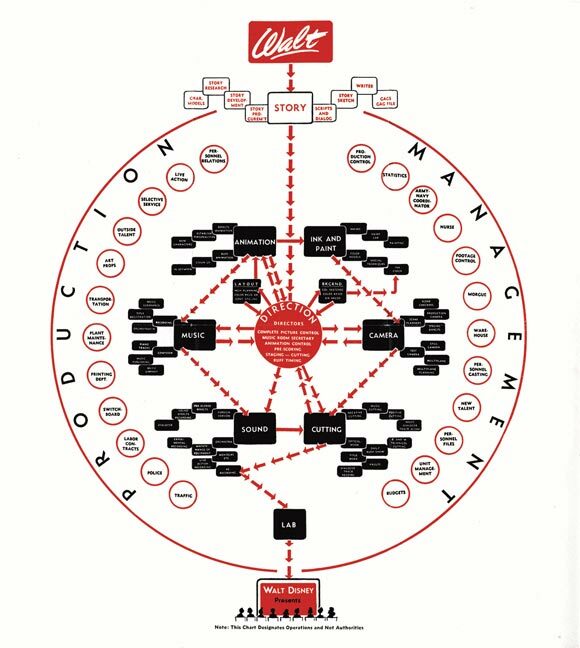 Walt Disney Org Chart is another creative organization chart that deserves to analyze here. 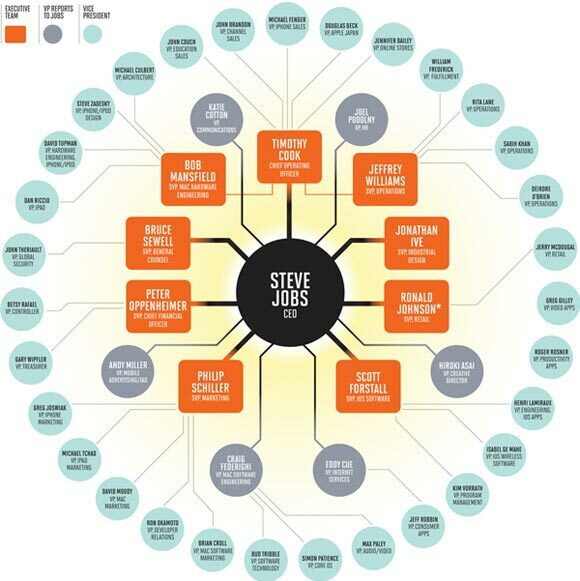 This org chart features a separation between two main departments that can be found in Walt Disney Company. Clearly the production department and the academy department. Then the Direction appears in the center of the diagram. 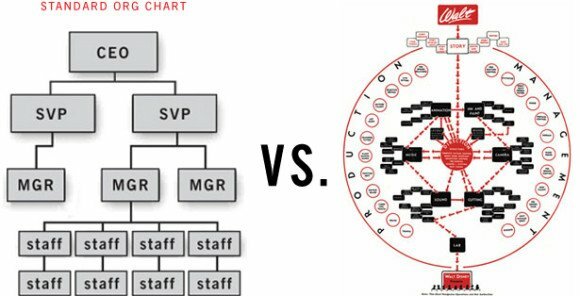 The standard org chart looks like the left diagram in the image below. As you can see, the CEO is appearing on top while other managers (MGR), Senior Vice President (SVP) and staff in the low levels. On CNN we can learn about other org chart ideas like the picture below. 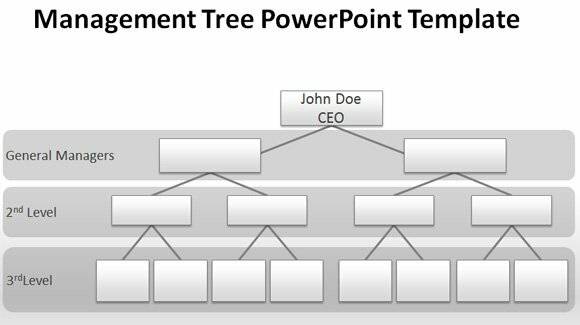 Then this animated Org Chart toolkit for PowerPoint can be helpful. 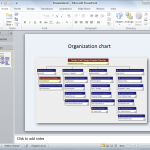 You can make animated organizational charts using this PowerPoint presentations and the shapes inside. This is provided by PresenterMedia in a subscription plan but once you register there you can get unlimited downloads including this org chart template. Using this design you can create awesome PowerPoint presentations with animated figures in an organizational chart or create awesome employee handbook presentations or employee tardiness presentations including memo or employee tardiness tracker. 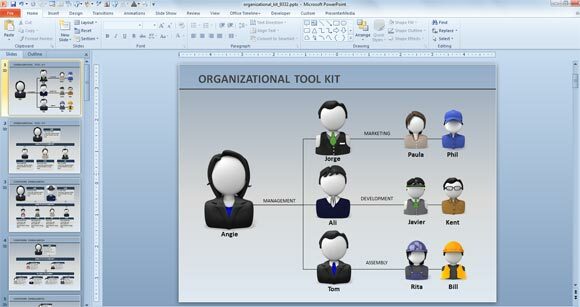 In PowerPoint you can do all these creative charts by using shapes, but if you want to stay with basic org chart then you can take advantage of SmartArt graphics. Using SmartArt you can for example create a photo org chart to put the photo of each staff member. Alternatively, you can use diagram software tools to make creative charts like this article where we showed how to make professional organizational charts using images or download a free blank org chart template.